Pole vault star Elena Isinbayeva has extended a string of failures, finishing at a low sixth place at the Athletics World Championships in Korean Daegu. The Russian two-time Olympic winner had been favorite to regain the world title she won in 2005 and 2007 but lost two years ago. However, she was far from her best on Tuesday. 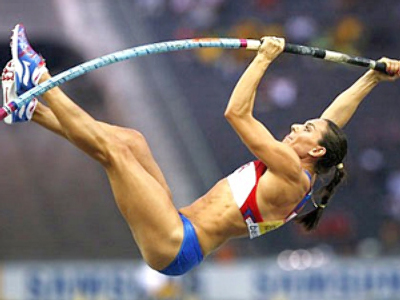 Isinbayeva started traditionally late and cleared the first height at 4.65 meters from the first attempt. But this turned out to be her last success of the day as she failed to conquer both 4.75 and 4.80 meters – a poor showing from one of the sport’s genuine greats. Isinbayeva’s team-mate Svetlana Feofanova sweetened the pill for the Russian fans winning bronze in the discipline. Fabiana Murer of Brazil added the outdoor world title to the indoor championship one year before the London Olympics, while Martina Strutz earned silver. In heptathlon, Tatyana Chernova overcame defending champion Jessica Ennis. The British star had held a 151-point lead over Chernova after the first four events on Monday, but failed to keep that advantage. Javelin was apparently the key discipline, as the Russian claimed season best of 52.95 meters, which contrasted sharply with Ennis' sub-par performance of 39.95. And the 800-meters race posed no problem for the Russian, who defended her huge advantage in style. Elsewhere, Yuliya Zaripova brought another gold medal for Russia, breezing to the victory in the women's 3,000-meter steeplechase. Meanwhile, 800-meter Olympic champion Yury Borzakovsky took the bronze, finishing behind arch-rivals David Rudisha and Abubaker Kaki.